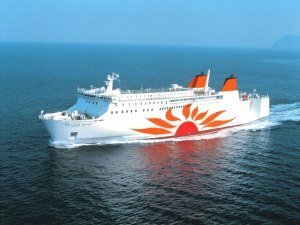 A regular ferry line connecting Osaka (Port of Osaka (South), Suminoe Ward, Osaka City, Osaka Prefecture) and Beppu (Beppu International Tourism Port, Beppu City, Oita Prefecture) in 12 hours. 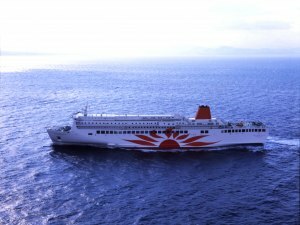 A regular ferry line connecting Kobe (Port of Kobe, Higashinada ward, Kobe City, Hyogo Prefecture) and Ōita (Ōita City, Ōita Prefecture) in 12 hours. We promise an elegant cruise through the Seto Inland Sea, spotted with numerous islands and often reffered to as the "Mediterranean of Japan" with our large car ferry boasting a capacity of 716 passengers and 75 cars. 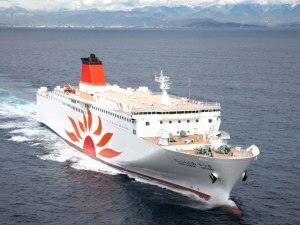 A regular ferry route connecting Osaka (Port of Osaka (South), Suminoe ward, Osaka City, Osaka Prefecture) and Shibushi (Port of Shibushi, Shibushi City, Kagoshima Prefecture) in 15 hours. We promise a elegant cruise with our large car ferry with a capacity of 709 passengers and 140 cars, fully equpped with a fin stabiliser for a confortable journey.